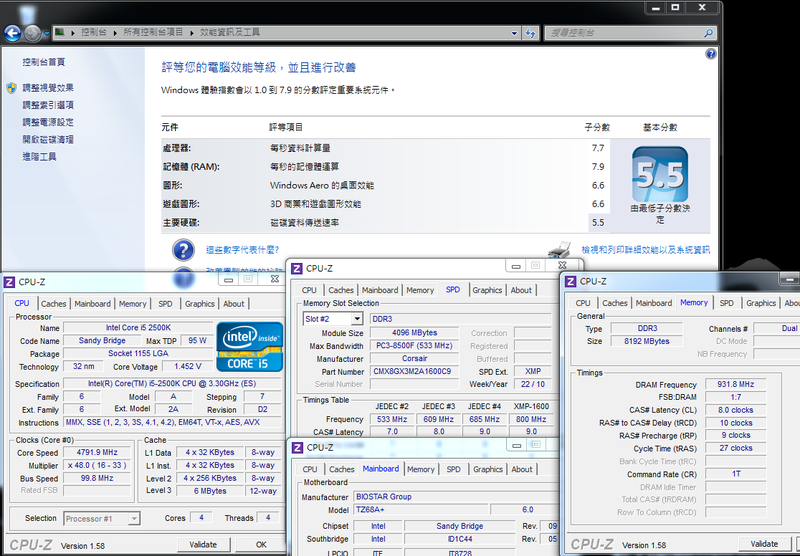 Intel released the Z68 at the end of May in this year, which is the latest chipset of Sandy Bridge. 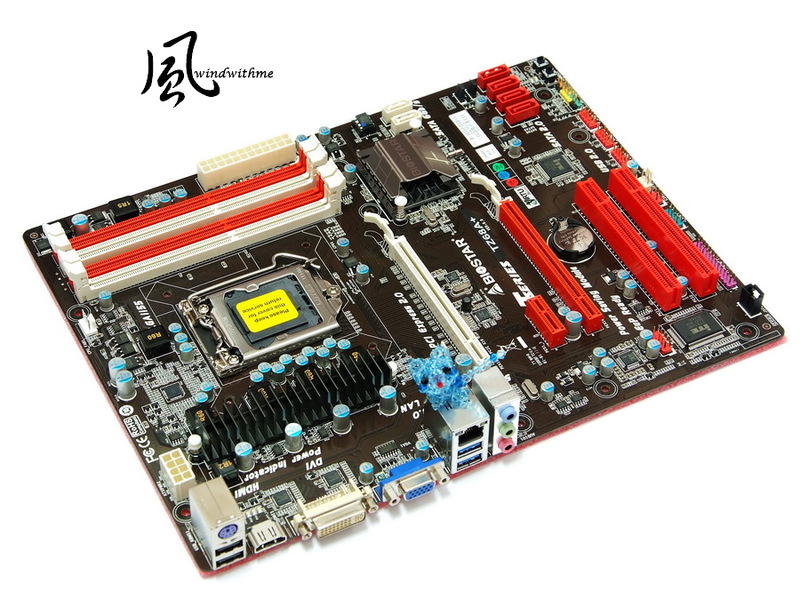 As Z68 is the advanced chipset for the latest Intel platform, the MB brands released various motherboards for Z68 within a short time. I also mentioned some related information in the last test report of the Z68. 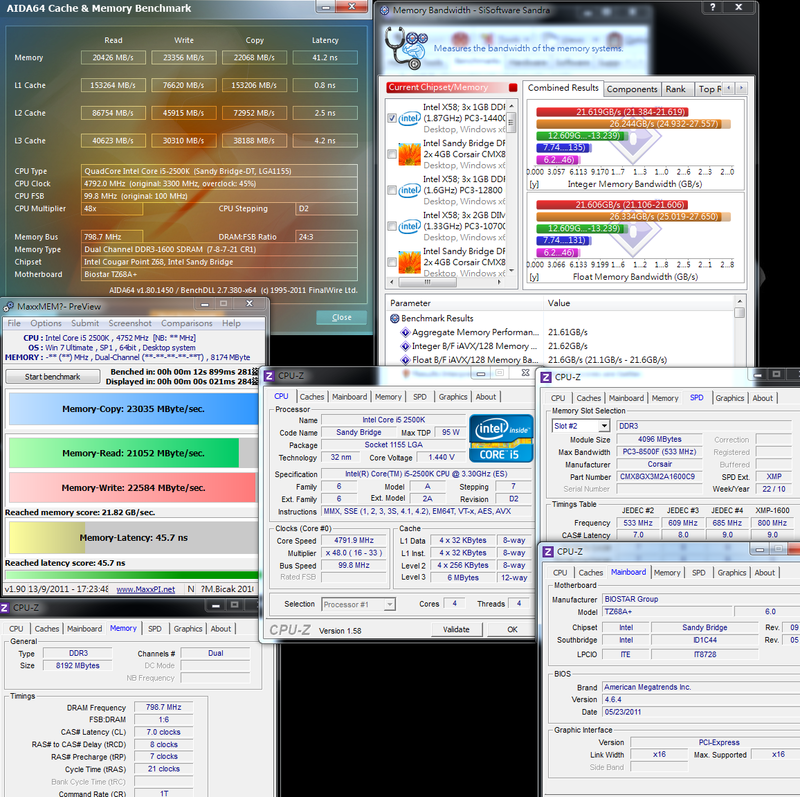 The features of P67 overclocking and H67 output display are integrated into Z68. To put it simply, the Z68 is the chipset that possesses the most technologies and features among the platforms of Sandy Bridge. There are four kinds of Sandy Bridge chipsets, namely, H61, H67, P67, and Z68, which are ranked from the lowest price to highest price. The H61 has output built-in GPU. 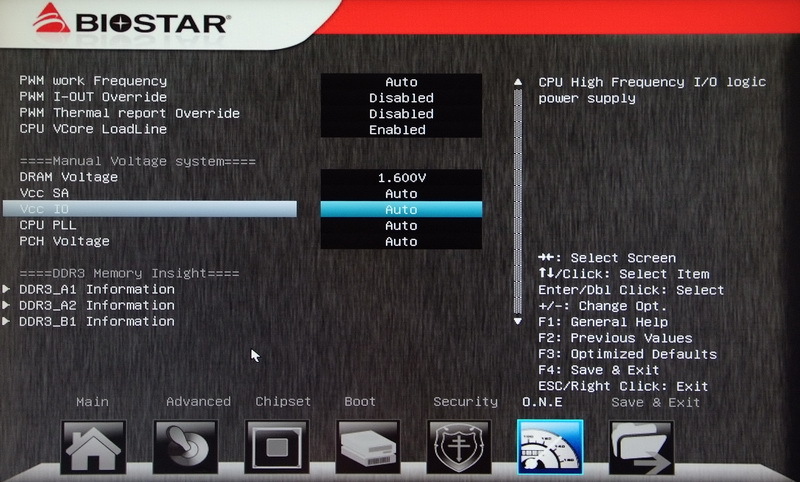 Its greatest difference with H67 is that it supports less DDR3 RAM and it has no RAID feature. The H67 has the advance version of the built-in GPU, it has a feature for adjusting the FSB frequency, but it does not have a feature for adjusting the CPU clock ratio. The P67 is designed for overclocking, and it also has a feature to for adjusting the FSB frequency and clock ratio. Its greatest difference with the H67 is that it doesn’t have integrated graphics output. The Z68 is the latest version and integrates all of the above features. It can be said that is is the enhanced version of the H67. Of course, its price is higher than the P67. 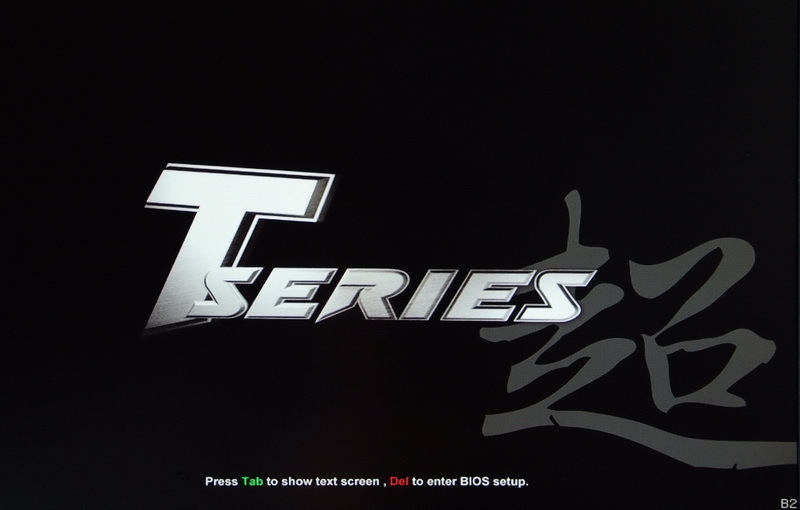 At first glance, I can clearly see the label “Tseries” on the box, which has simple colors. User’s manual, IO board, SATA wires and software driver disc. 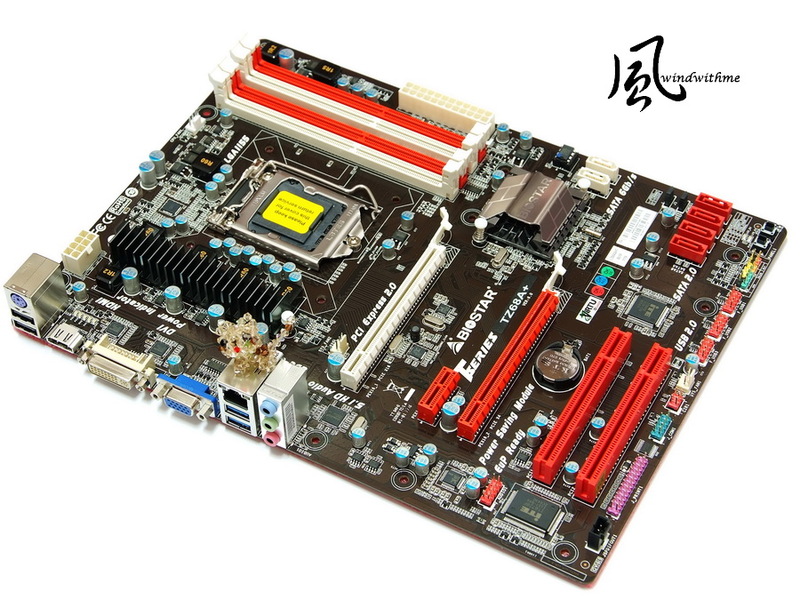 It mainly uses black PCB, and red-white PCI-E and DIMM slots. The appearance and texture are both good. It is a little smaller than the common ATX size of 30.5 X 24.4 cm. 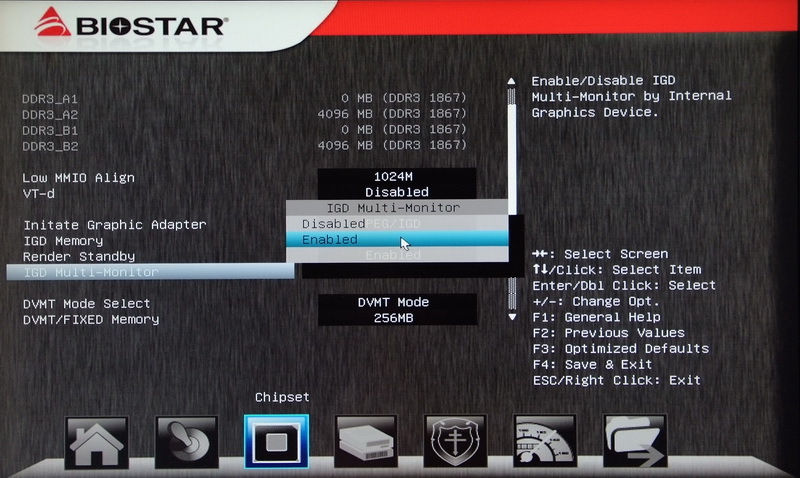 4 X red SATAII connectors are provided by the Z68 chip, which are of SATA2 specification and support RAID 0， RAID 1，RAID 5, and RAID 10. 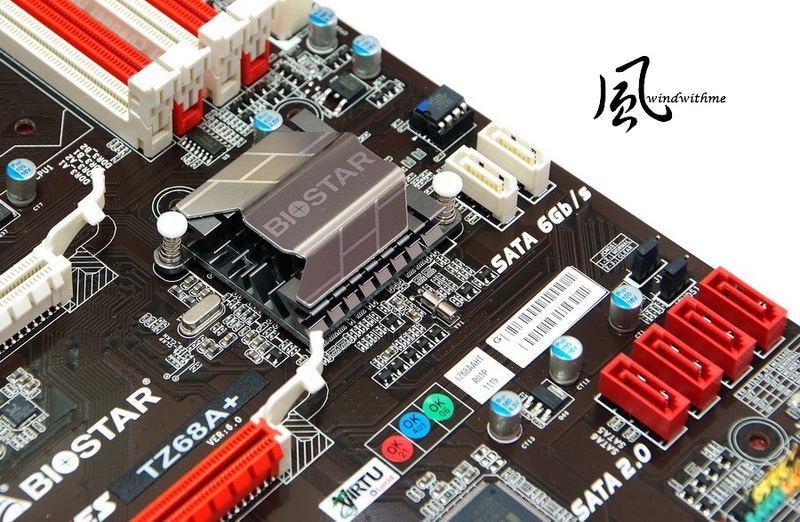 2 X white SATAIII connectors are provided by the Z68 chip, which are of SATA3 specification and support RAID 0， RAID 1，RAID 5 and RAID 10. 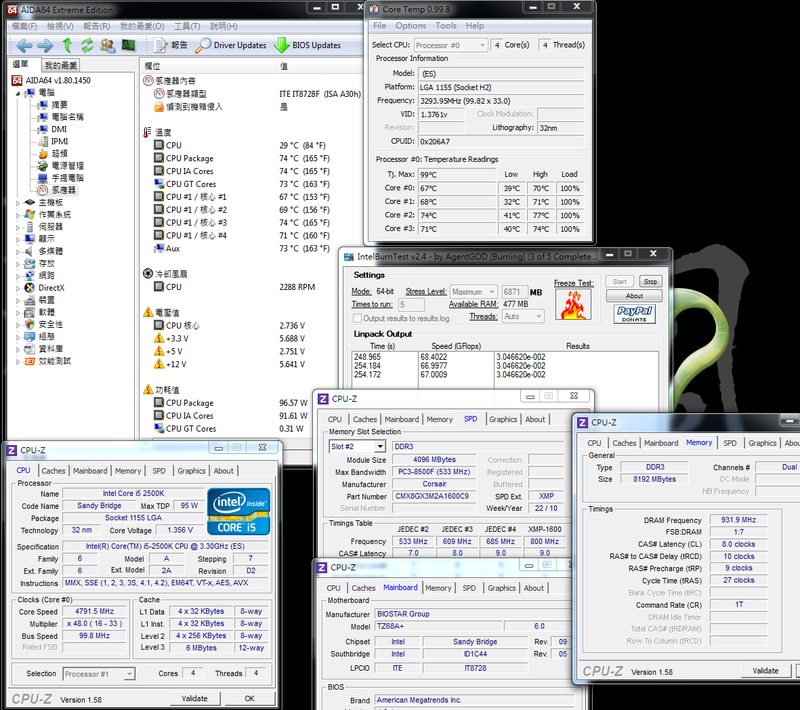 4 X DIMM DDR3 slots support 1066/1333/1600/1866/2133/2200, and the highest DDR3 capacity supported is 16GB. 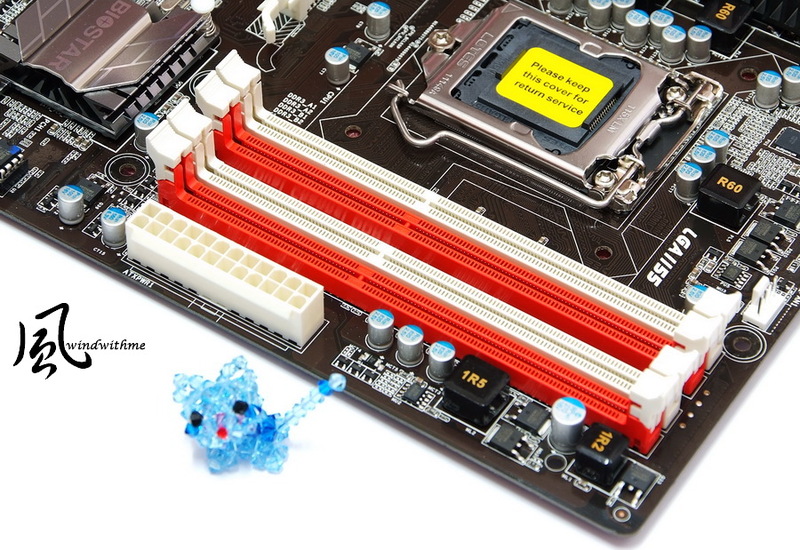 Specification of DDR3 2133 or higher can be only achieved by CPU overclocking, and if the DIMMs are placed on the slot closest to the 24-pin ATX power connector. TZ68A+ requires 4+1 phase power supply, and this power supply design is enough for the 32nm CPU to run. 8Pin power input is in the upper left. The chipset is covered by the heat sink. The appearance and texture are both good. 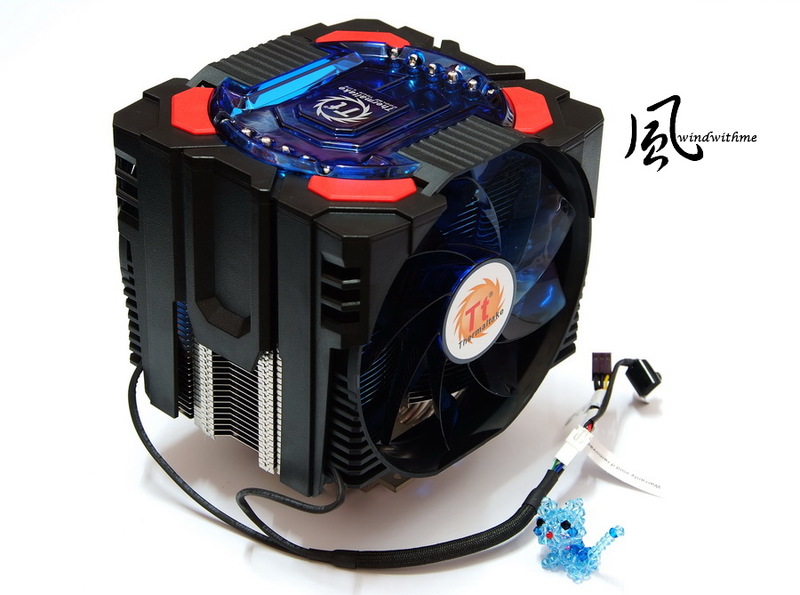 However, the heat sink is small due to the price limitation. 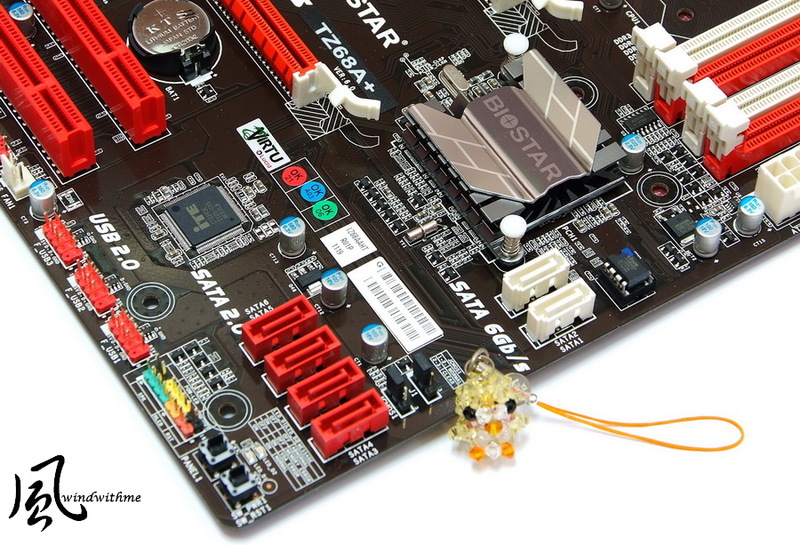 BIOSTAR uses the same design and material in the heat sink of P67/H67/Z68 chipsets. First, I tested one of the major features of Z68 chipset, the Intel Smart Response Technology (hereinafter referred to as SRT). The user needs to install Smart Response Technology version 10.5 or higher to be able to use it. Intel Smart Response is mainly for increasing the performance of an HDD, by using an SSD to enhance the performance of the storage system. 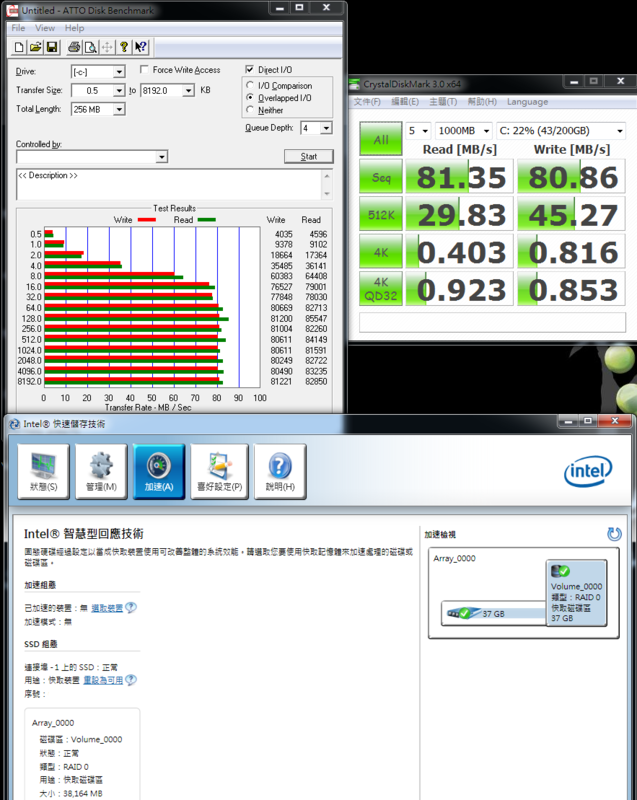 The recommended SSD capacity used is 18.6 ~ 64GB. 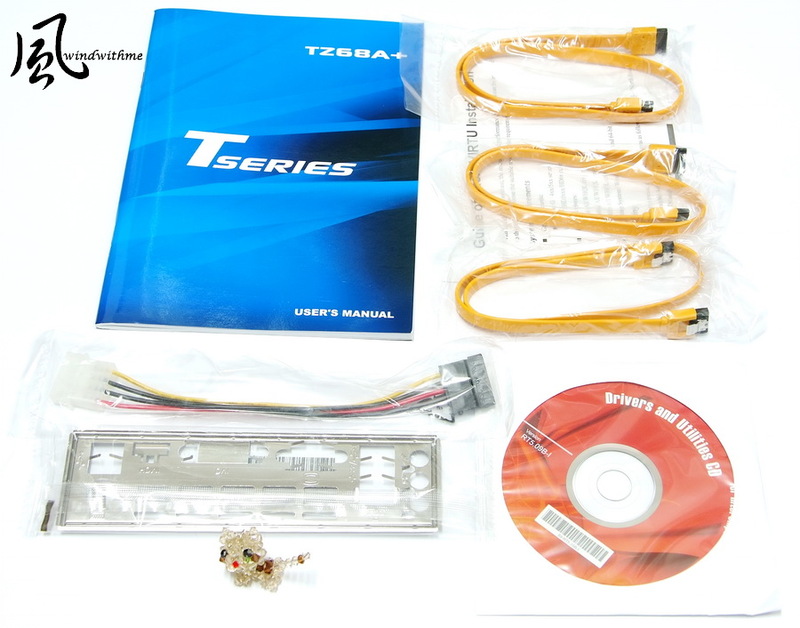 This is ideal for those who have small-capacity SSDs or want to enhance their system performance by using SSD. SRT technology will reduce the cost needed for such performance enhancement. ATTO DISK Benchmark shows a maximum access speed of 85.5 Mb/s and a write speed of 81.2 MB/s when the test exceeds 64k. 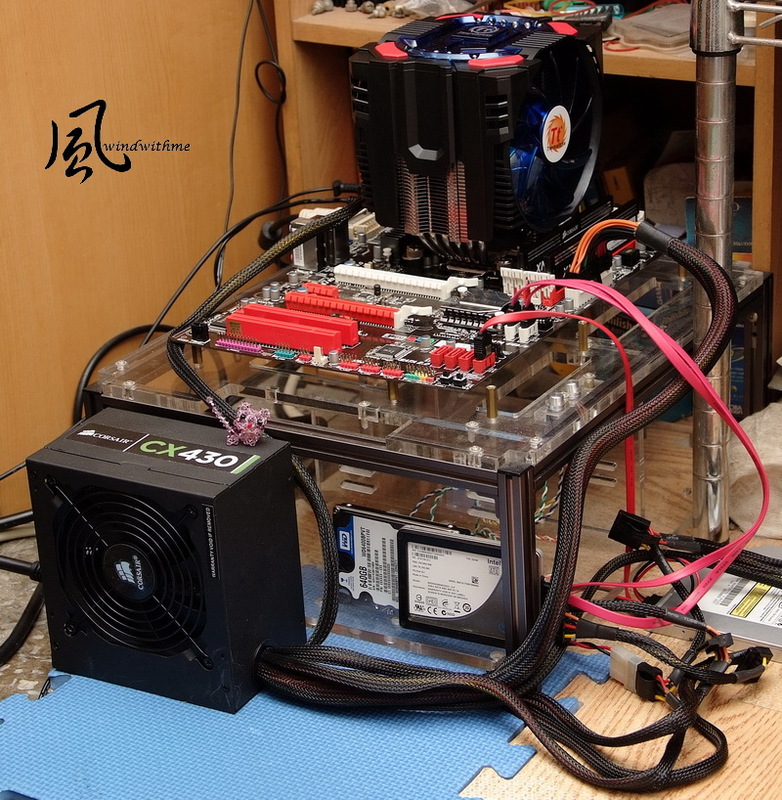 It can reach the access performance of 70MB/s when the test exceeds 128k. When tested using a WD 2.5-inch blu-ray 5400 rpm 640GB HDD, The tested performance data reached 80MB/s, with over 60MB/s on the average. There are two modes for SRT acceleration: enhancement and maximization. Enhancement mode – This mode optimizes data protection. The write and search performance are improved to SSD level, while 4K and write speed are still at the HDD level. Maximization mode – This mode optimizes the input/output performance. 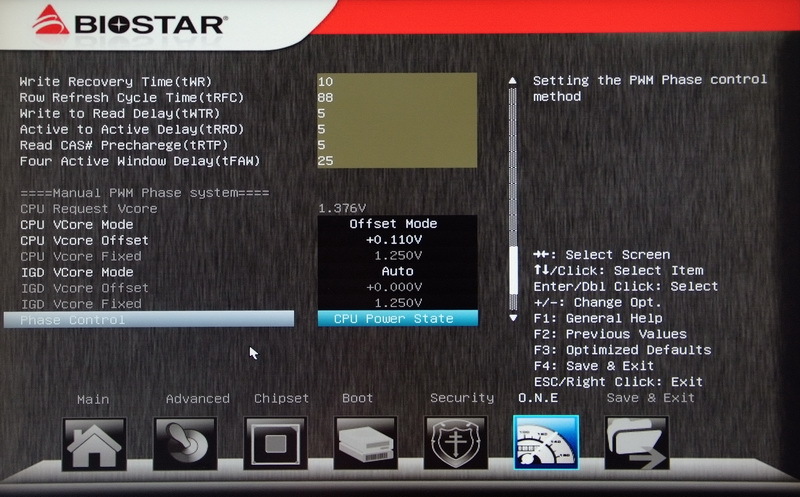 The performance of enabling this mode is exactly the same as the current performance of SSDs. However, maximization mode uses the SSD as a cache where files are stored into it for system use. In case of a system crash, the data in the SSD might be lost. For data protection, the enhancement mode stores files into both the HDD and the SSD, so as to prevent data loss in the SSD. For performance, the maximization mode can enable the system to get maximum performance from the SSD. Both modes have strengths and weaknesses. It is up to the user to make the final decision according to one’s specific needs. ATTO DISK Benchmark shows a maximum access speed of 157.2 Mb/s and a write speed of 46.1 MB/s when the test exceeds 16k. It can reach a maximum access speed of 150MB/s when the test exceeds 256k. 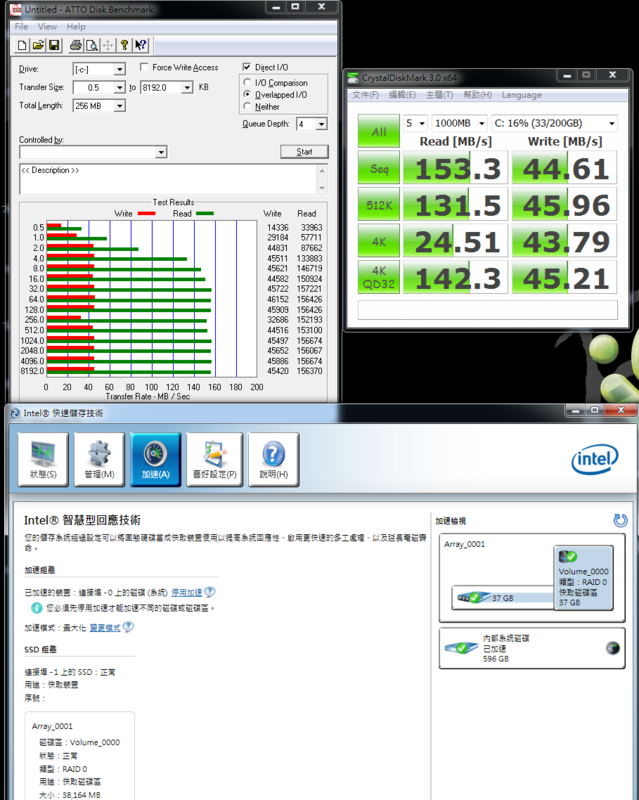 SSD used in the test is the Intel X25-V 40GB, which has an access speed of 170 MB/s and write speed of 35 MB/s. Enabling maximization mode can get the best performance of this SSD for access, write, 4k, or search time. Although its write speed is not as good as that of an HDD, the other 3 performance parameters make it much faster for booting up the system and or for opening files. 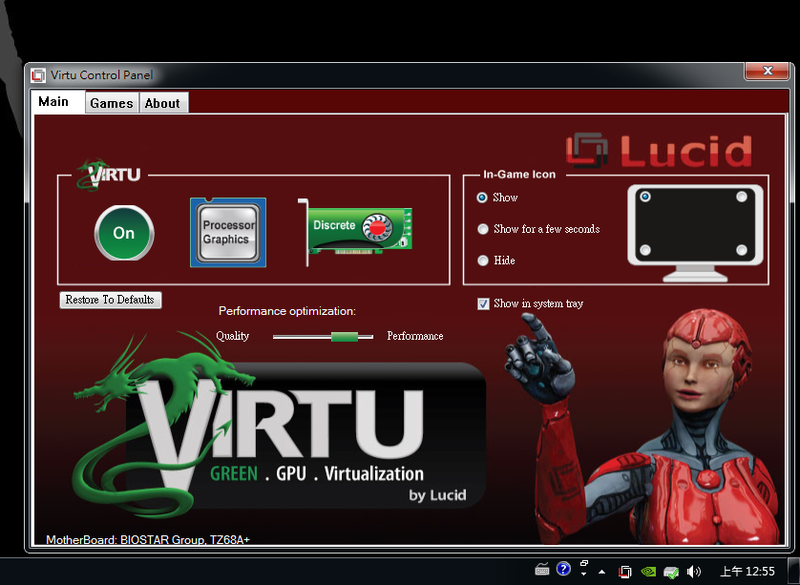 Another feature of Z68 is the GPU virtualized technology released by Lucid Virtu, which enables users to dynamically switch between the built-in GPU and an external GPU. After starting the application, it will display a small icon at the tool bar on the bottom right corner of the screen. The dragon design on the left side of the icon is beautiful, while human design on the right side of the icon can still be improved. GPUs I used were, respectively, the Intel HD Graphics 3000 and the nVIDIA GTX560 Ti. My monitor is connected to the DVI port of the GTX560 Ti. The GPU switching is done through the application. I used MediaEspresso to compare the speed of video conversion when using the built-in GPU and the external GPU. The lower left shows nVIDIA CUDA technology is enabled. For the same video conversion above, Intel Quick Sync Video is 1 minute 7 seconds faster than nVIDIA CUDA. With the Intel built-in HD3000, it could save the time by over 22%. Thus, it could save much time for the user with video conversion needs. I have always thought it was such a pity that the file conversion feature of the onboard display was not used. For now, the Z68, with the Lucid Virtu technology, allows a user to switch GPU freely using a software application, which is much more convenient. The biggest difference between UEFI interface and conventional BIOS is that with the UEFI, you can set options by using a mouse. In addition, you can also post some beautiful background image on it, so that the interface could look prettier. 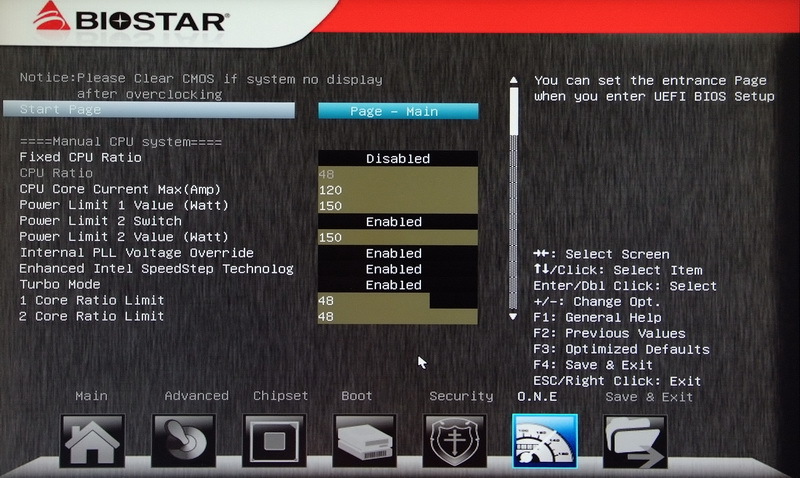 To enable Lucid Virtu feature, you need to enter the Chipset page to enable IGD Multi-Monitor. Internal PLL Voltage Override is the option for Intel special overclocking, which effectively enhances the stability of a highly overclocked CPU. 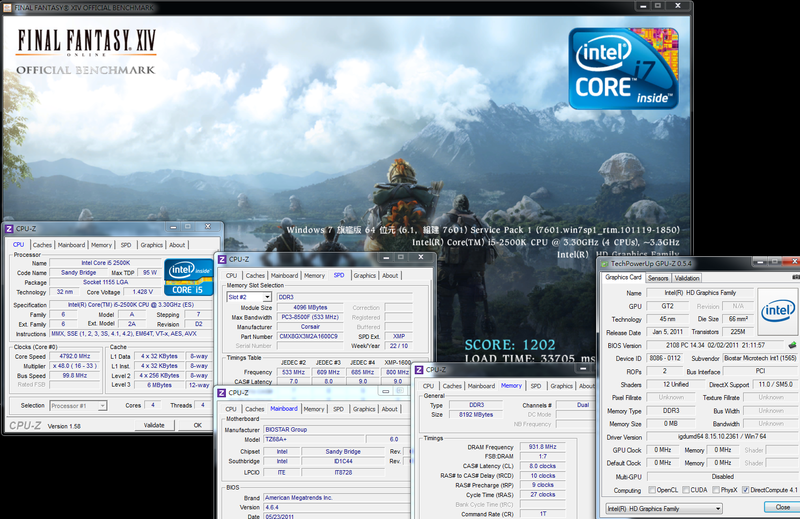 Graphics Core Ratio Limit is the overclocking option for GPU frequency, preset as 22. Each cell represents 50MHz, so 22 cells equals 1100MHz. 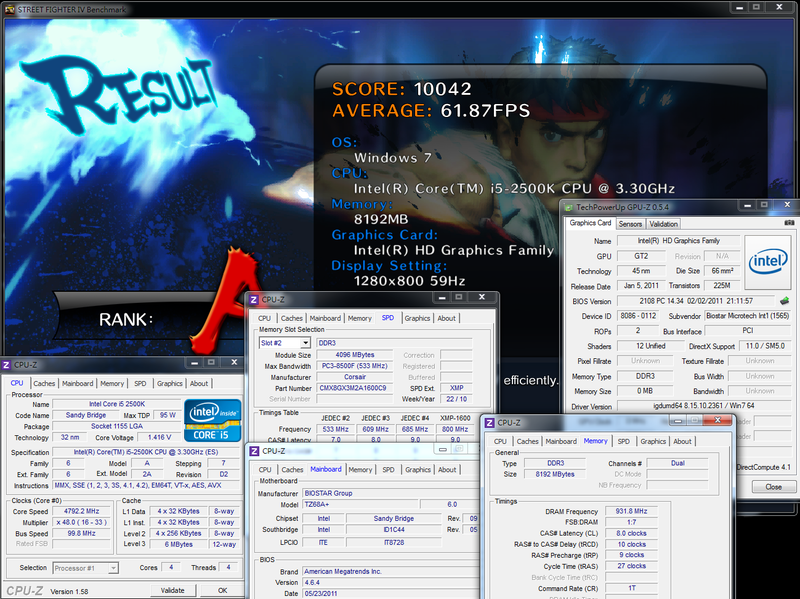 The overclocking value in the figure is set at 1800MHz for the test. 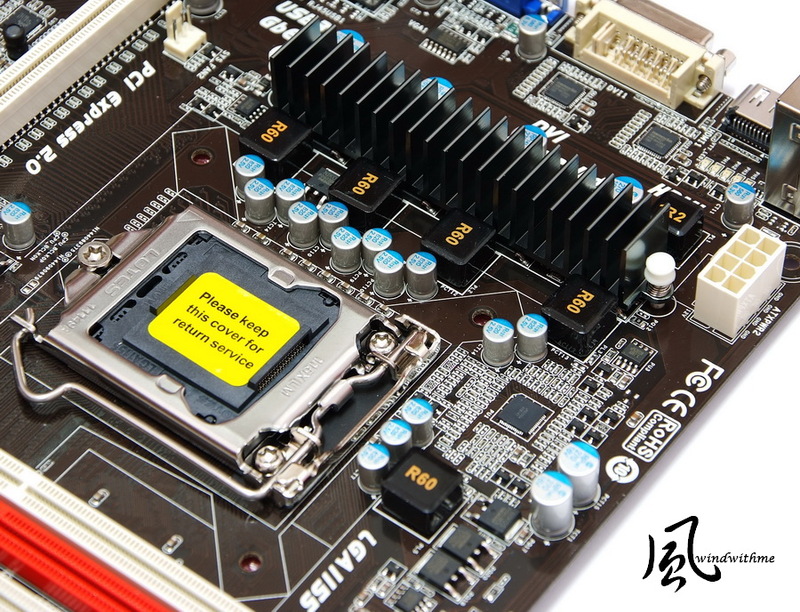 DRAM division supports 1066~2133 modes, so that the user can enjoy the supposed DDR3 performance more easily. 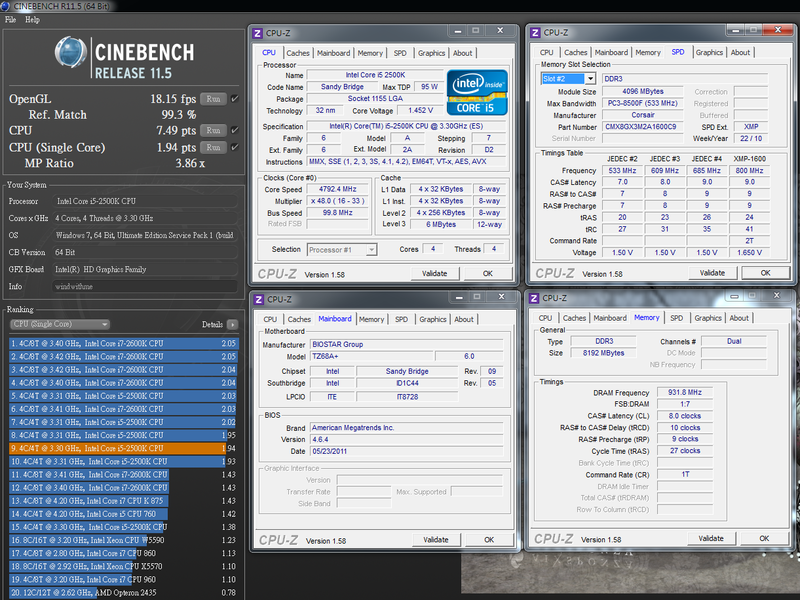 The top is the setting page for detailed DDR3 parameters. 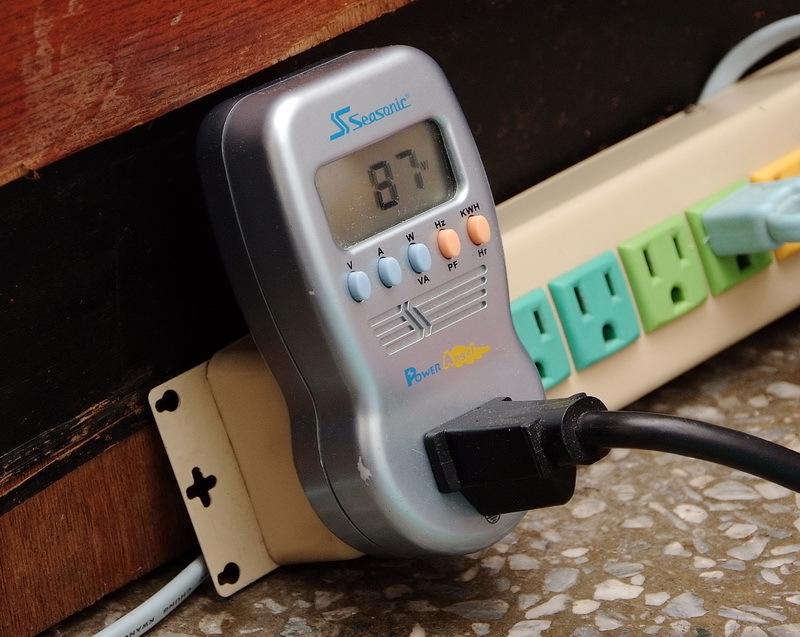 The monitor chip built in the MB is used to view the status of various primary voltages and temperatures in the system. It seems that the CPU temperature reading tends to be higher than the ambient temperature around the heat sink, or the temperature displayed by the software in the OS. 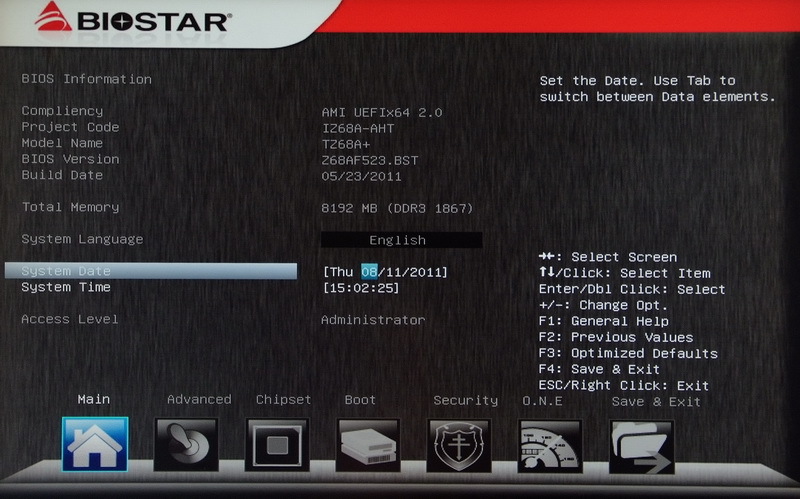 BIOSTAR is abreast with the trend of using UEFI, which also makes for a more user-friendly interface and makes operating more convenient. Even if the TZ68A+ belongs to the low-price range, it is rich with options. 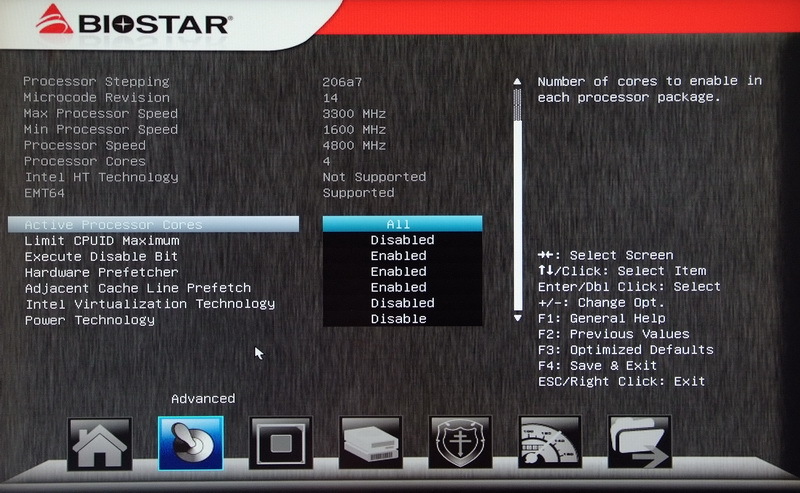 The settings above are for CPU OC 4.8GHz and DDR3 OC 1866, providing reference for users with similar configurations. I used the first version of Frio. You can use one or two 12cm fans, if you want. According to the test, there is a high-level of cooling performance, so I’m having a good impression of the Frio series. 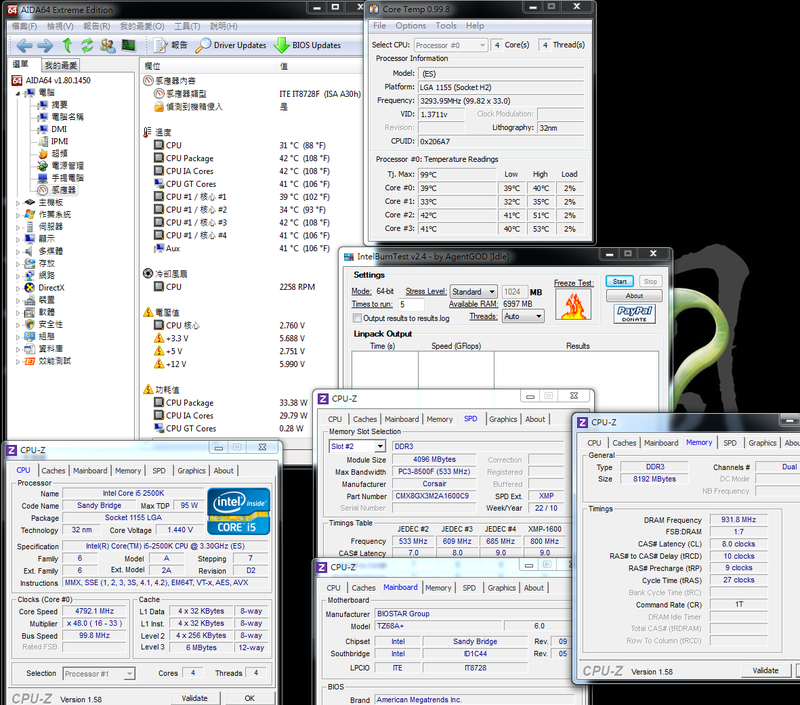 This time, I have used the most advanced Frio OCK of Thermaltake, which is designed for CPU overclocking. OCK is designed for enhanced heat dissipation. 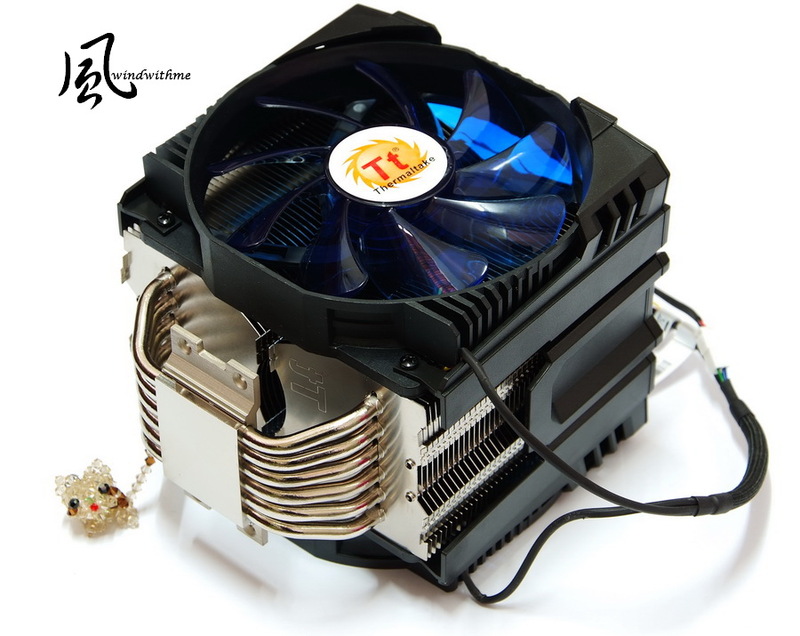 The user needs to install dual-fans and heat sinks, which is easy, but its bulky. No problem is found on LGA 1366 platform has no, but on the LGA 1155 platform, it might interfere with one or two DIMMs due to a different slot location. In this case, the problem can be fixed if you install DDR3 DIMMs of standard height. It will interfere if you have installed large overclocking DDR3 DIMMs. The two cooling fans both have variable fan speeds controlled by a single VR knob based on your specific needs for cooling performance and noise. At the bottom, there are six heat pipes on each side. Compared to the last version of the Frio, there are two more heat pipes on this one. 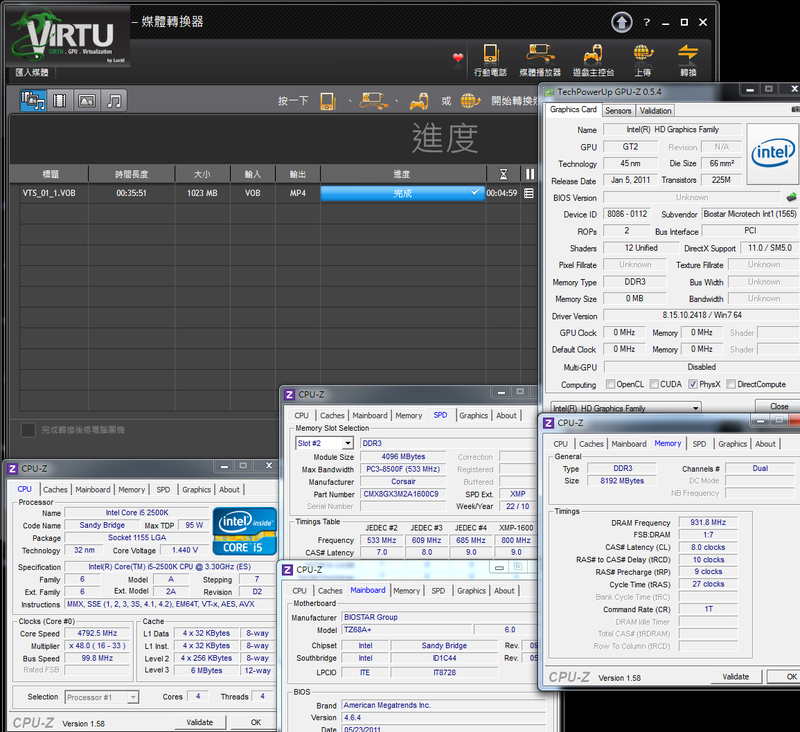 After overclocking 4.8GHz of 2500K, the performance increased by 30~40% compared to the default value, according to most of the software test results. 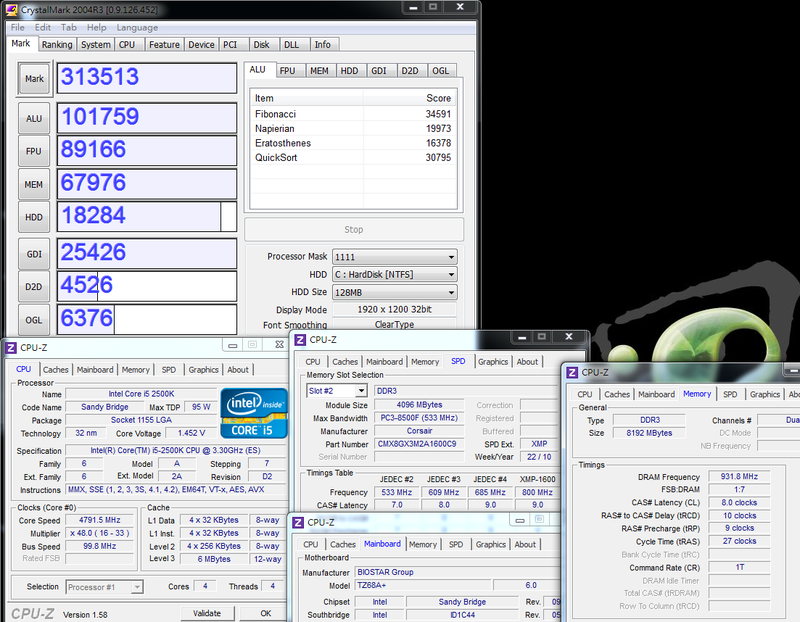 I personally hope to conduct overclocking test on a CPU under 1.4V. It can be stable for a long time. Moreover, the increased frequency and voltage, the temperature won’t be much higher. Generally, this system can meet the common demands. 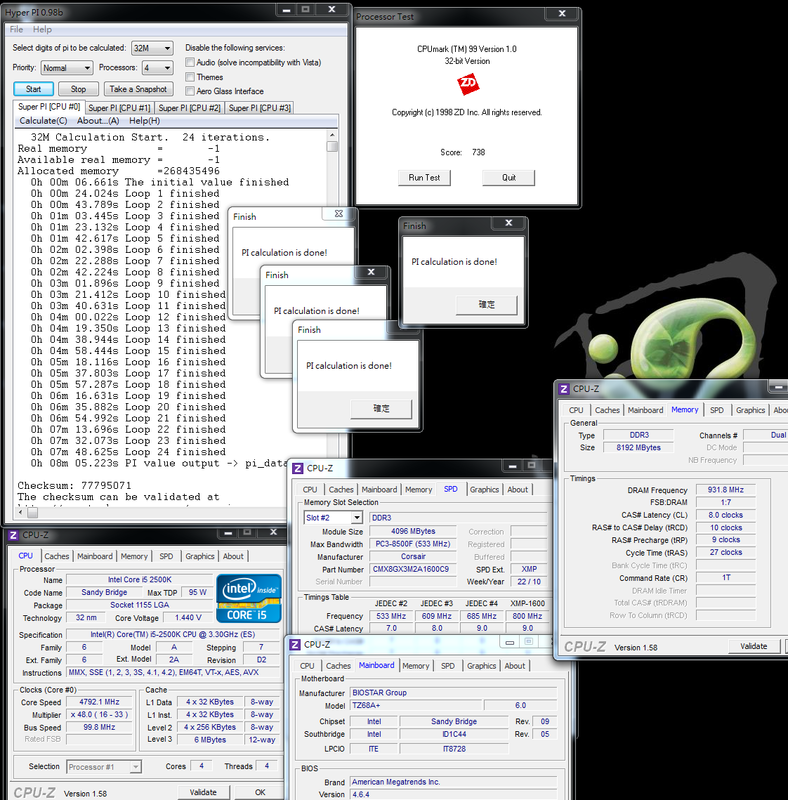 The CPU can get quite high scores under various test software. 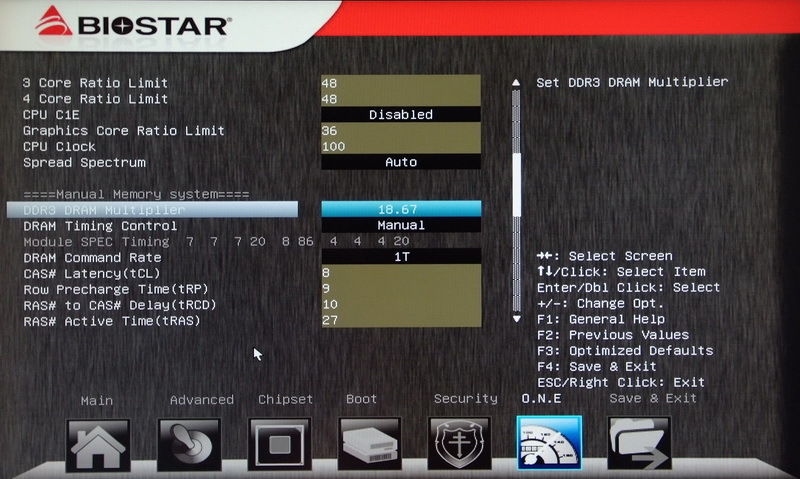 After actual adjustment, the parameter is set as CL7 8-7-21 1T/DDR3 1866 CL8 10-9 -27 1T for DDR3 1600 or so. 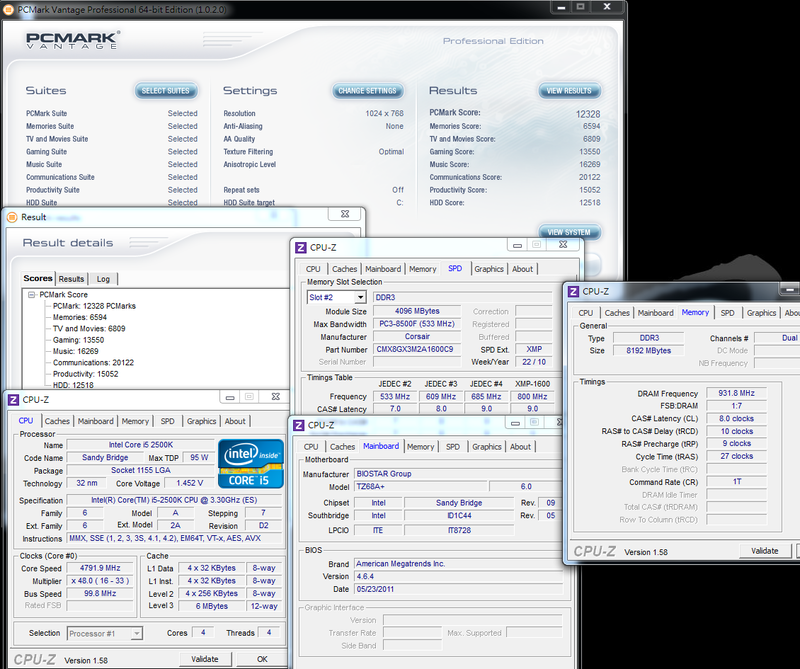 The frequency range for overclocking and the reduced parameter data both get good performance. 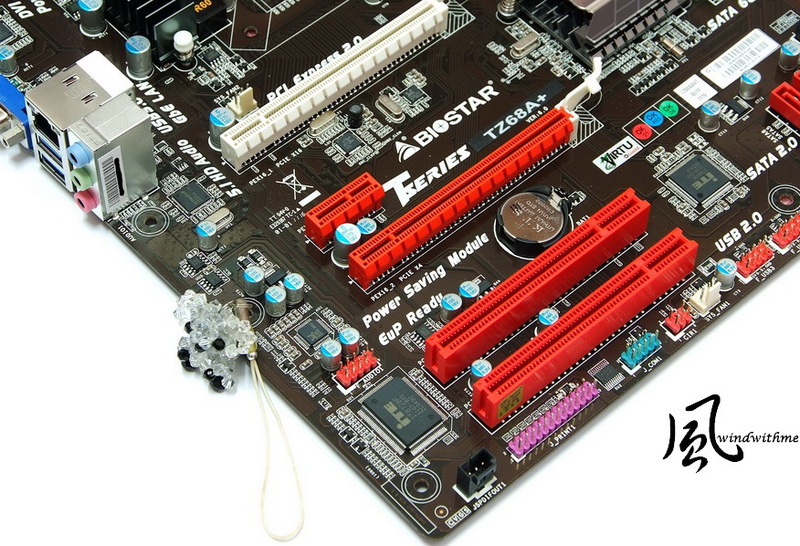 The most significant performance improvement can be observed after it is increased to DDR3 1866. Windwithme has shared much about the 3D performance of the HD2000, and also compared the test results of overclocking. HD3000 used in this test can reach up to of 2000MHz, but the 3D performance did not significantly increase after 1800MHz. 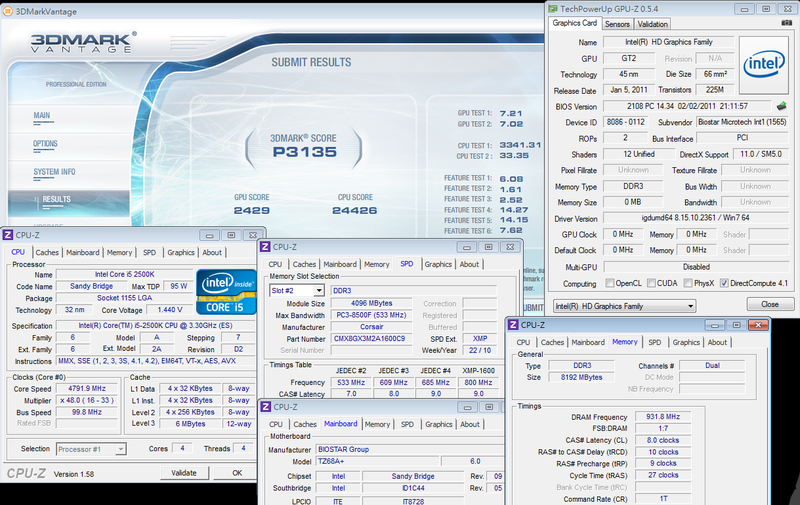 So I completed the test shown above at 1800MHz. 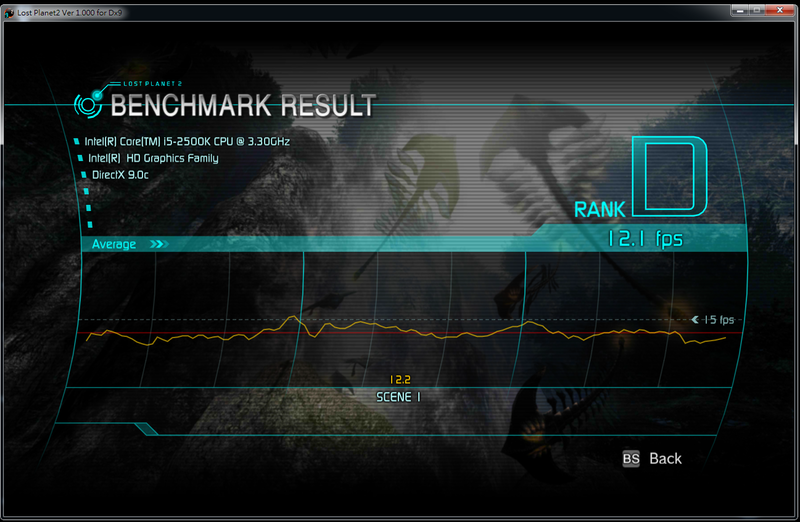 The performance after overclocking is 3 or 4 times better than that of HD2000. HD3000 can be used for 3D software or games with medium or lower requirements as long as the resolution is not adjusted too high. The highest temperature is about 74~77 Celsius. The ambient temperature now is much higher, but it is still within the acceptable range. 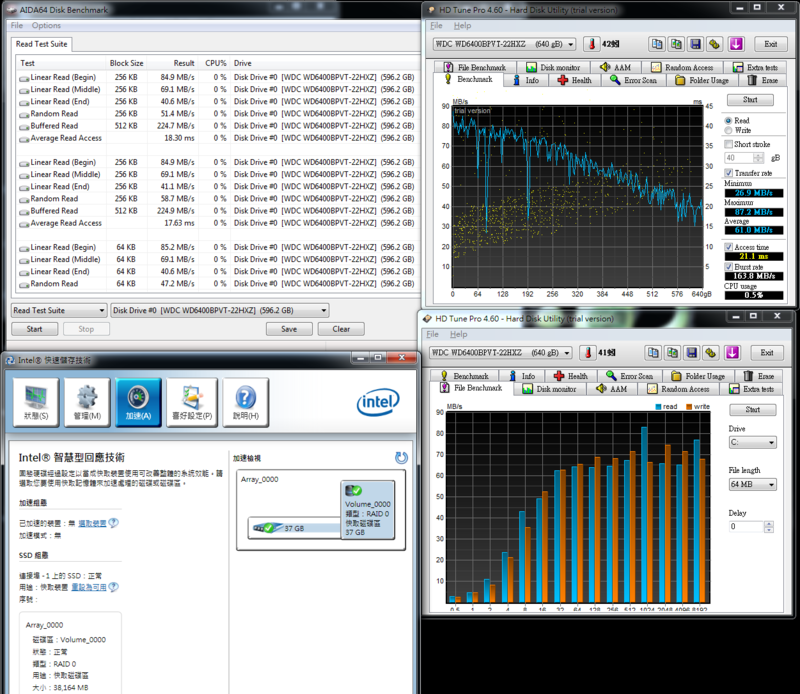 Additionally, it can undergo the complete burn-in test of Intel Burn Test v2.4. If it is in the computer case, the temperature difference will be 5 Celsius more. Sandy Bridge is made using the 32nm manufacturing process, so extreme frequencies are obviously increased. which is also my main reason for using Frio OCK for this test. If the original heat sink is used during CPU overclocking, the temperature will greatly increase when burning-in it above 4.2GHz. 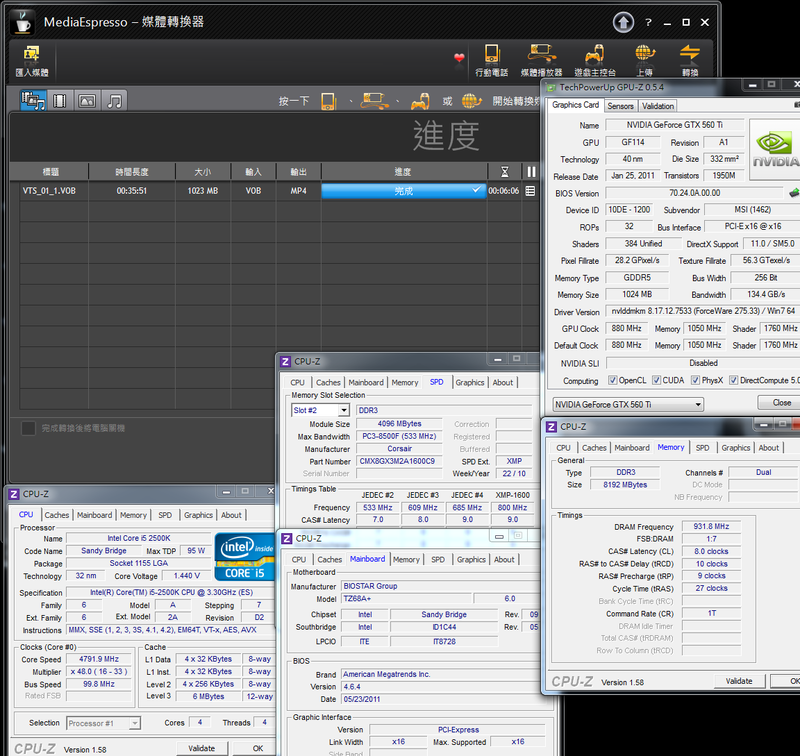 For the overclocking platform of Z68, I want to make a more detailed comparison on the power consumption test. 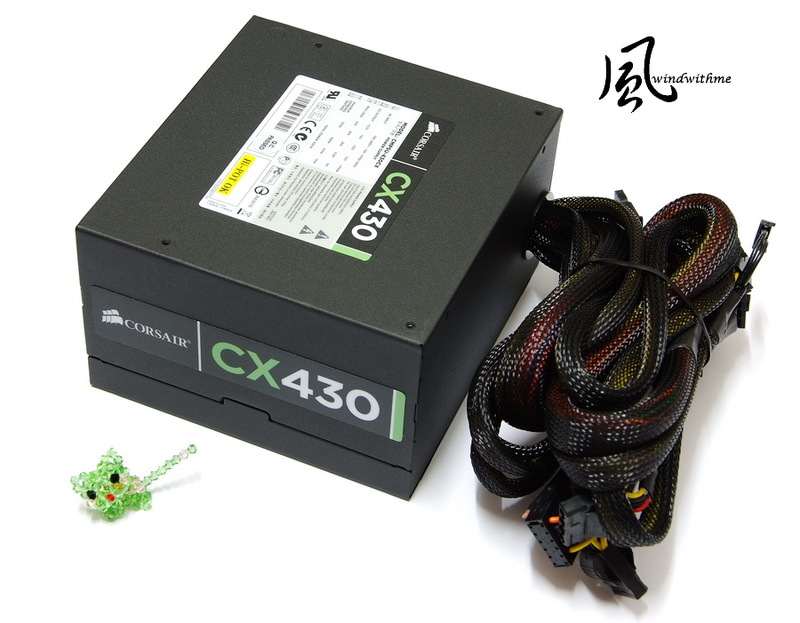 Power Supply used is the CX430 of CORSAIR Builder, with an output specification of 430W. The matte black shell, plus the entire black color, makes for good texture. Even with a 12cm fan, it runs quite silently. 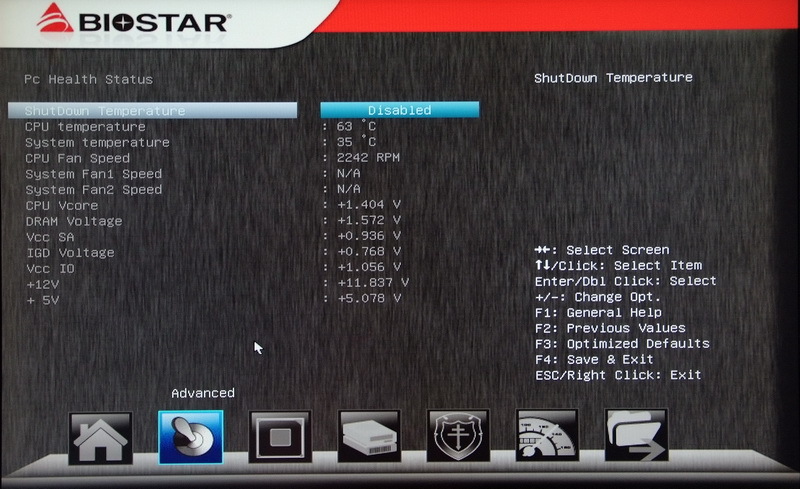 When overclocking the CPU and using the built-in GPU, the power consumption is not so high when on system standby. 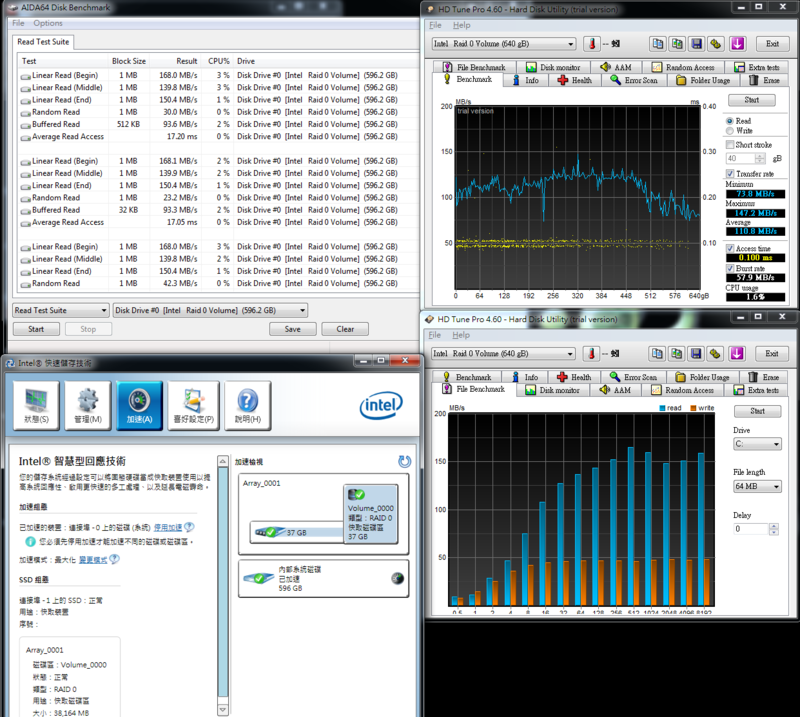 When the CPU/GPU are fully loaded during the OCCT Power Supply test, the highest power consumption was about 260~270W. –Using the GTX560 Ti at medium or advanced level, its power consumption increased significantly at full speed, reaching around 480W. The efficiency of CX430 is about 80%. The test above environment used 110V and a maximum 476W. The highest power output after conversion is about 381W. and it maintained a low temperature – as determined by touching the the CX430 shell.. 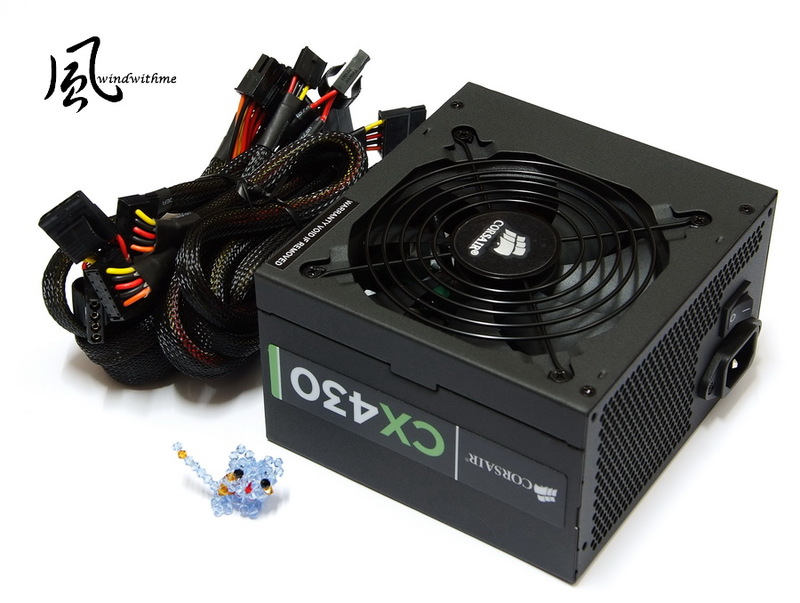 It proves that a 430W power supply is enough. 1. High-end Intel chipset like the Z68, with a low price, is really rare. 3. 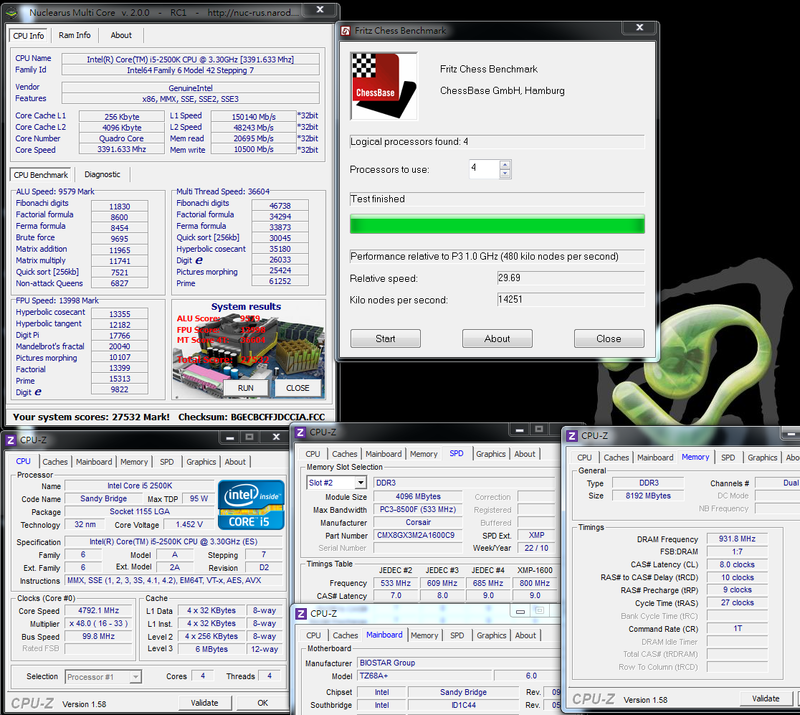 Its BIOS has been upgraded to UEFI interface, with rich options, a large voltage range, as well as excellent overclocking capacity. 5. The onboard GPU, with three output ports, also supports Intel SRT and Lucid Virtu. 2. It will be more practical if the USB ports at the rear IO are increased to 6. The two major features of Z68 chipset are the Intel Smart Response Technology and the Lucid Virtu. I hope the above test sharing can help the user interested at a Z68 have a better understanding to it. Together with all the features of the Sandy Bridge platform, the Z68 is a rather good choice for the user who is looking for multi-function and high performance. 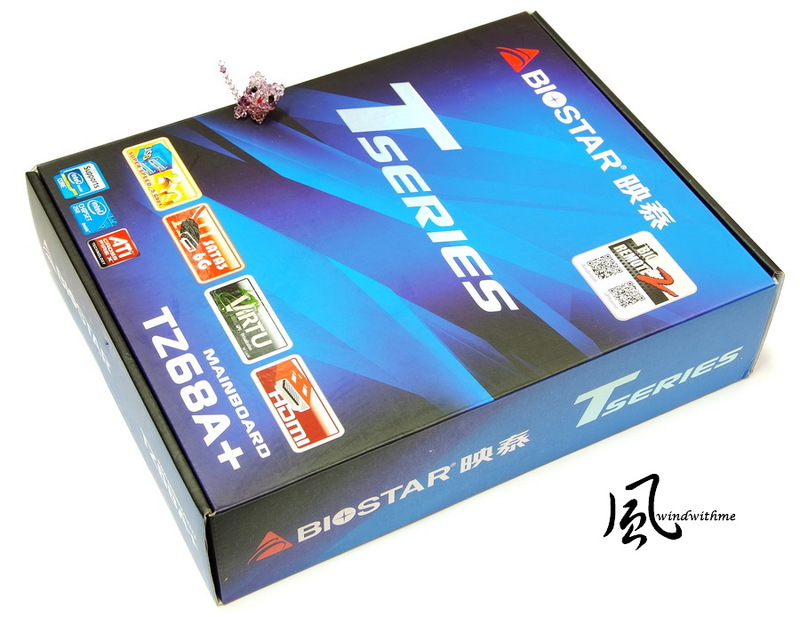 The price of this BIOSTAR TZ68A+ will be about US$99(NT$2855). It is surprising to see the Z68 with this low price for the first time on the market, which is even as low as some basic chipsets, like the H61. After comparing all prices of the Z68 on the market, this one could be the lowest-priced Z68 MB, though the materials and specifications are not as good as the other Z68 MBs with higher price. However, it has all the basic features and technologies, such as USB 3.0, so it could be quite a practical Z68 product. 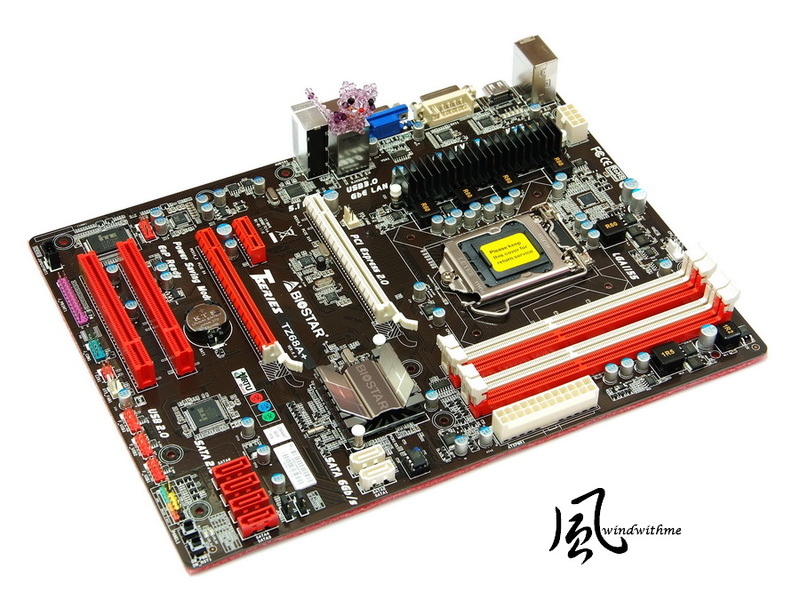 Other advantages are: the BIOS with UEFI interface, and rich features, wide voltage range; it has outstanding performance in overclocking. One weakness is that there are only 4 USBs on the rear IO, which is kind of inconvenient to the users who need many USB ports.